Alexander played at the Ark Hills Lunch Time Concert with pianista Binbn and percussion Ludwig. 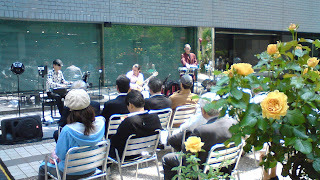 The weather was so nice and the best day to listen the Cuban music outside under the sunshine. This time they only played instrumental due to the restriction of the office building but the next time they hope to play a couple of songs with vocals. Please don't miss it next time!